Finally, there was a little bit of sunlight on Saturday so I could photograph a number of finished projects. 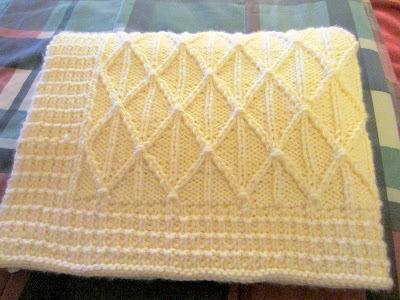 First up is the baby blanket that I knit for dear friends who just had their first child. The pattern is Crisscross Applesauce by Aimee Alexander that I bought from Polkadot Sheep. 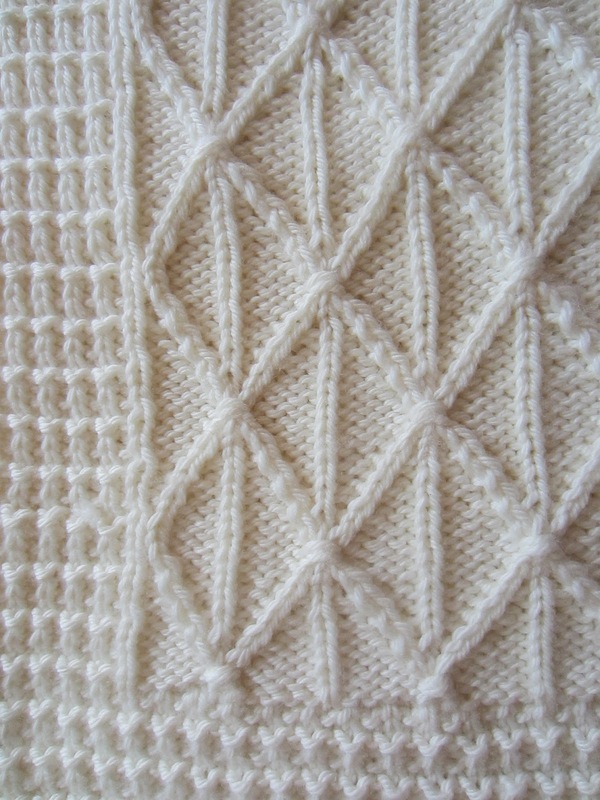 I think it has a very heirloom quality about it, so I knit it up in a classic off white. I used Cascade 220 Superwash Aran yarn in the colorway also called Aran. 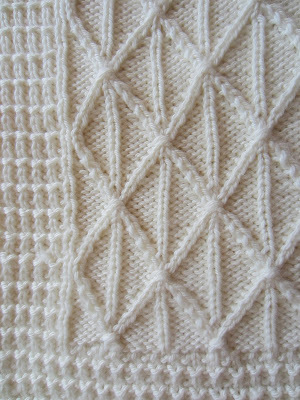 And, really, it does look inspired by an Aran sweater, doesn't it? Isn't it a pretty pattern? One of the things I like about the Cascade superwash yarns for baby gifts is that they are beautifully soft and drapey merino wool, but they are machine washable. So, easy for mom and soft for baby. I wish you could reach through the monitor and feel this blanket. It's exactly the sort of cuddly thing that you would want to wrap a baby in. 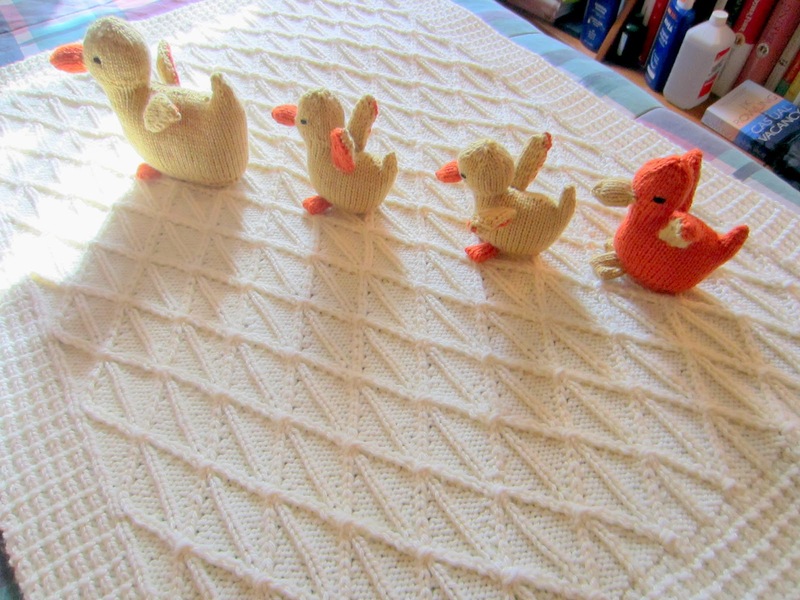 The pattern comes in four sizes. 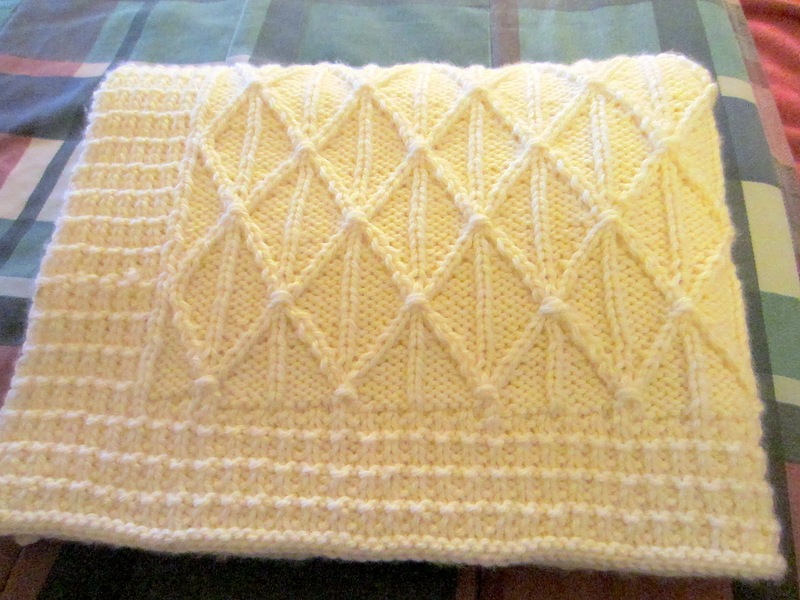 I made the second smallest, which is 25x32 now that it is finished and blocked. Honestly, it took a while to knit this up on size 8 needles, but I think the results are worth it. If I was a faster knitter, I'd make one of these in the largest size as a throw blanket. Alas. But this one is is boxed up and ready to go to it's new little owner along with this little ducky family, and just in time since I was starting to get attached to this little duckling. Several more sewing and knitting projects this week, peeps! 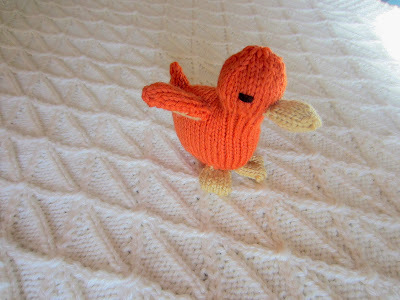 I love those duckies, especially the idea to make one last one out of orange - so cute! And that blanket is beautiful. You make the best baby gifts! Wow - this is just beautiful. I don't know why I don't knit a blanket. I LOVE handknit blankets. And you can control the feel by choosing the yarn you like best. Really amazing present, I have to say. What a lucky baby! The blanket is lovely! Perfect gift for a baby. I wish I could knit!! Beautiful work that will be greatly appreciated by the recipient. Yeah, this is actually sort of tempting me into thinking about knitting a throw blanked for myself. I think it's just the size that I find off putting. Wow!!! You finished those sooo fast!!! 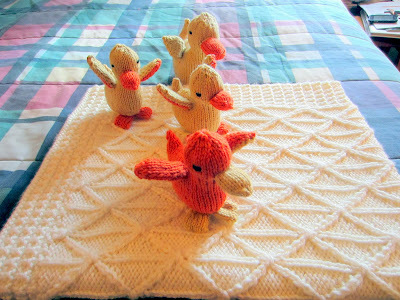 The blanket is gorgeous and the ducks are sweet!!!! What a beautiful gift!!! Ha ha. I guess that is a matter of perspective - to me, it feels like it took forever! That is a beautiful, beautiful blanket! I would wear it as a sweater lol. And I love the photo with the ducks crossing it.